FEATURES BIG HITS "I WALK THE LINE" "JACKSON" "ORANGE BLOSSOM SPECIAL" "IT AIN'T ME BABE" & "UNDERSTAND YOUR MAN"
Johnny Cash was born during the great depression into a poor family in Arkansas. At a very young age he worked on the family farm and experienced many of life’s struggles. This is also the time he would develop his love for music, family and the Bible, which followed him closely throughout his long career. In the early fifties after spending time in the Air Force, he moved to Memphis, became friends with folks like Roy Orbison, Carl Perkins, Elvis Presley and Jerry Lee Lewis, and ultimately cut some sides at Sun Studios which became the catalyst that would kick-start the beginnings of a soon to be worldwide superstar, troubadour and humanitarian unlike the world has ever known. The folks at Columbia Records knew that this young fellow named Johnny Cash was destined for super stardom. They quickly signed the legend to a long term deal, and his first Columbia singles like his prolific "Don’t Take Your Guns to Town" forever etched “The Man In Black” trademark to his name. In 1967 after many chart topping country and pop albums and a bevy of hit singles and Grammy Awards, more fame followed as the brass at Columbia Records honored their journeyman Johnny Cash with his first hits collection, the multi-platinum "Johnny Cash’s Greatest Hits." The album was a blockbuster as it topped the charts, making this a crossover hit with both country and pop audiences, proving once again that his career was of historic merit. Filled with more hits than a roadside jukebox, the amazing album takes off with the classic duet with wife June Carter Cash and Grammy Award winner "Jackson." This chart topping single is followed up by one of his most famous songs the number one "I Walk the Line." More treasures follow with the country belter "Understand Your Man" and Cash’s own hit interpretation of "Orange Blossom Special", which truly made the album a treasure trove of hits. More greatest hits follow as the LP features a nice helping of solid smashes like "Ring of Fire" "Five Feet High and Rising" and probably one of the first Bob Dylan covers ever with his haunting "It Ain’t Me Babe." 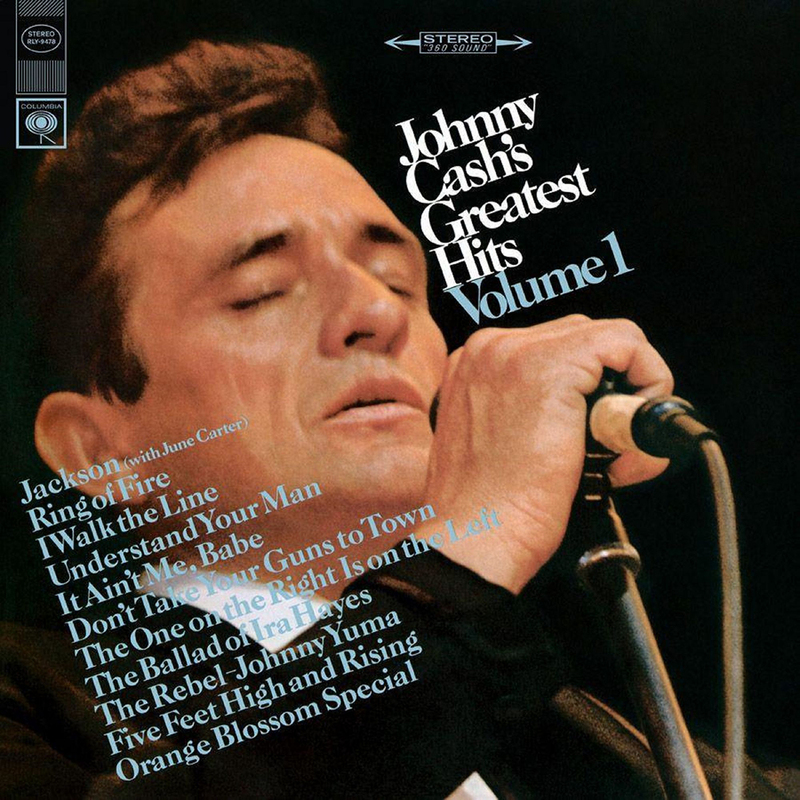 In total, the album showcases eleven important Johnny Cash recordings which have truly gone on to become international classics for all time. In honor of the Man, the Music and the Legend, Friday Music is very proud and honored to announce the first time 180 Gram Audiophile Translucent Gold Vinyl release of the Columbia Records classic "Johnny Cash’s Greatest Hits." As another fine installment in our exciting Johnny Cash 180 Gram Audiophile Vinyl Series, we are very pleased to present this masterwork in all its stereophonic glory. Mastered impeccably by Joe Reagoso at Friday Music Studios and manufactured at R.T.I., Johnny Cash’s Greatest Hits will be a much anticipated dream release for his fans everywhere! For this exclusive presentation, we are also including striking gate fold artwork which includes the groundbreaking original LP cover photo by Sandy Speiser and are also enclosing a poly bag to protect your album cover and poly lined inner sleeve to help keep your Johnny Cash vinyl in mint shape.